If you’ve visited more than one website on your iPhone or other smartphone, you can probably tell the difference between a responsive web design and one that is not. 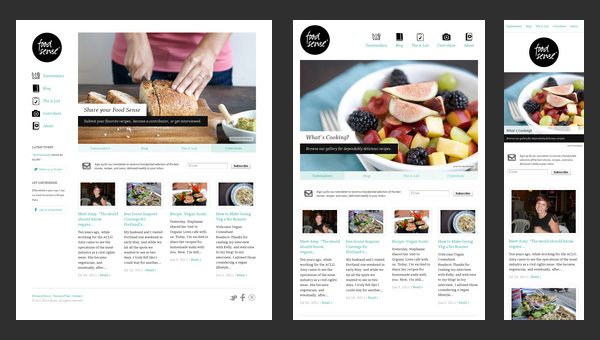 Last year, many designers were talking about how 2012 was the year of responsive design. Now, in 2013, responsive design is critical. So, what is responsive web design, and why is it so crucial? A responsively designed website is, essentially, a site that is easy to read and navigate on a smartphone. As little as a few years ago, this term was, to say the least, on the design back burner. However, with the recent rise in popularity of smartphones and tablets, responsive design is a “household word” (so to speak) in the design community. Internet users accessing the web rose from 800 million in 2009 to roughly 1200 million in 2012, according to a recent ComScore Survey. Statistics expect mobile internet usage to outnumber desktop internet usage by 2015. CSS Media queries which adjust the website according to the device it’s being viewed on. The image below is a good visual example of responsive web design at it’s finest. The easier your website is to navigate and access content, the more likely your visitors will stay for longer periods of time. In fact, 40% of mobile users reported immediately leaving a website which wasn’t responsive- with the plethora of websites on the web these days, it’s crucial to keep your potential client or visitors attention, as opposed to pushing them to the competition. As with anything in the tech world in which we live, it’s crucial to stay up to date with the times and best practices. As you can see responsive web design is crucial in 2013. So, is your company website responsive?